Okami apparently didn't sell well on the PlayStation 2, because people were too excited about the PlayStation 3. While it went on to be more successful on the Wii, Okami's original release on the PlayStation 2 could have gone an awful lot better. Critics heaped praise on the game, but Japanese gamers didn't seem to want to buy it. Motohide Eshiro, producer for the sequel to Okami, Okamiden, thinks he knows why the game didn't sell well, and says it doesn't have anything to do with the game itself. Instead, he thinks that it was simply a case of being in the wrong place at the wrong time. Okami first came out in Japan on the PS2 in early 2006, something that Eshiro thinks is critical to why it underperformed. He felt that the reason that the game sold poorly was because its release coincided with the announcement of new consoles from Sony and Nintendo. He said that the hardware news overshadowed everything else, and so Okami never got its moment in the sun. He made it clear, however, that this was just his personal view about the game, and not an official statement from Capcom. It's not all that hard to imagine that people might be reluctant to invest in games for one generation of consoles when they know that the next generation is just around the corner. But while the news would certainly have an impact on sales, it doesn't really adequately explain Okami's very low Japanese figures - reportedly just 66,000 units on the PS2 in the first year. It seems pretty clear that there are other elements in play besides people being distracted by newer hardware. 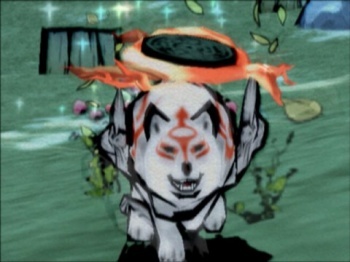 Hopefully Okamiden, with its simply adorable God-Puppy hero Chibiterasu, will fare a little better when it comes out on March 15th.